It’s August 2015. Get Your TBR List Ready! The Girl Who Slept With God – Val Brelinski (Aug. 4th/484 p./Viking) This debut set in the 1970s follows three sisters from an upstanding family and one returns from a retreat pregnant with God’s child. Anyone see the movie Agnes of God? It was interesting to say the least and I’m curious to see how this story plays out. Infinite Home – Kathleen Alcott (Aug. 4th/336 p./Riverhead) We’ve all read those books with an eclectic cast of characters and this book sounds like no exception. A widow named Edith rents out her brownstone in Brooklyn to numerous people who are desperate for shelter for one reason or another. They all have obstacles to overcome as does Edith and her devious son Owen. Fishbowl – Bradley Somer (Aug. 4th/304 p./St. Martin’s Press) Don’t you love finding that book that is unlike any other? Ian’s fishbowl sits on the 27th-floor and has always wanted an adventure. When the opportunity arises, he jumps from his bowl and as he descends, looks into each tenant’s apartment to see how the other half live. Oh, if and you didn’t guess it, Ian is a goldfish. Villa America – Liza Klaussmann (Aug. 4th/432 p./Little, Brown & Co.) I’m a sucker for coastal covers and this type seems to be everywhere these days. Sara and Gerald Murphy were expats who moved to the French Riviera in the 1920s and partied with the likes of the Fitzgeralds, Hemingways, Picassos and that wild crowd of artists. I LOVED Mrs. Hemingway and while caught up in Ernest’s affairs, I always wanted to know more about the Murphys. All That Followed – Gabriel Urza (Aug. 4th/272 p./Henry Holt & Co.) This debut caught my eye with this description: “Inspired by a true story, All That Followed is a powerful, multifaceted novel about a nefarious kind of violence that can take hold when we least expect.” Yes, I like my darker novels and this one set in a small town in Spain has thriller/mystery/psychological twist written all over it. The State We’re In: Maine Stories – Ann Beattie (Aug. 11th/224 p./Scribner) I have yet to read any short stories by Beattie and think this collection will be the start. These are “linked stories that perfectly capture the zeitgeist through the voices of vivid and engaging women from adolescence to old age.” And what is on that cover?! The Beautiful Bureaucrat – Helen Phillips (Aug. 11th/ 192 p./ Henry Holt & Co.) I don’t even know how to describe this horror/mystery/sci-fi/dystopia novel. I’ve read very few reviews about it but hear I just need to dive right in. Click on the title for the synopsis and you just might be as intrigued as I was. Best Boy – Eli Gottlieb (Aug. 24th/256 p./W.W Norton & Co.) I have an affinity for books dealing with mental illness and in Best Boy, Todd Aaron is in his fifties and eager to leave his therapeutic home after being there since he was eleven. A new resident disrupts his routine comforts and makes him think about the life he once had as a child. What new releases are you looking forward to in August? Tags: Ann Beattie, Bradley Somer, Eli Gottlieb, Gabriel Urza, Helen Phillips, Kathleen Alcott, Liza Klaussmann, new releases for August 2015, Shirley Jackson, Susan Barker, Val Brelinski. Bookmark the permalink. This is a good selection. Glad to have them on my radar! Almost all of these are on my TBR, too! August is looking like a great month. What a great list! I LOVED The Beautiful Bureaucrat and am planning to read Best Boy in August as well. I’ve also got my eye on Villa America and The Girl Who Slept with God! Great selections!! I have The Incarnations on my list too – I’m a bit intimidated by it for some reason! It seems so epic in scope. But I’m going to give it a shot. And I’m so excited for Let Me Tell You too – I can’t wait to trot over to the bookstore and pick it up on Tuesday! 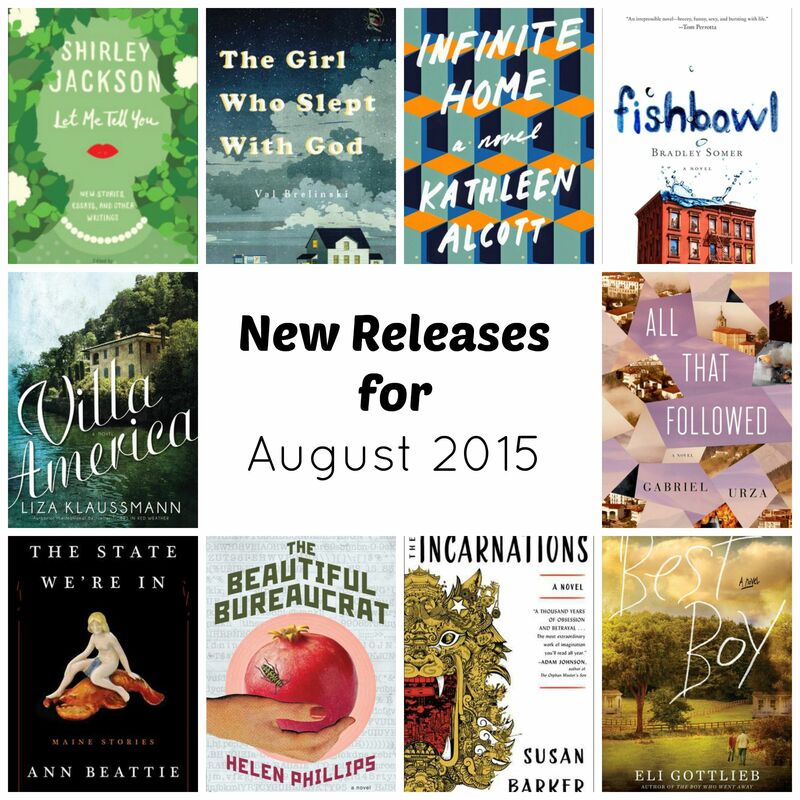 Cheers to great August reads! I think we have similar tastes 🙂 I’ve read two of these already, and have at least 3 more to get to this month! Late summer/early fall is always so killer for new releases! I am so excited for The Girl Who Slept With God. And I have not seen that movie! I will have to look for it. Best Boy and The Girl who Slept with God are on my list. I REALLY want to read The Girl who Slept with God. I don’t think I’ll be able to keep myself from clicking that one. We have some overlap so I’m bailing on Villa America until I hear what you think! I finished Girl Who Slept with God and was reminded of Agnes of God. Feel like I need to watch that again. The two books I’m most looking forward to for the rest of the month are: Vanessa Diffenbaugh’s We Never Asked for Wings (I loved The Language of Flowers) and Alice Hoffman’s newest, The Marriage of Opposites.